We uploaded a new header and updated the color scheme of the blog. What do you think? Our web designer, Rachel, has been creating headers for our Duggar blog for the past two years. She and her husband, who live on a farm in the Midwest, recently welcomed their first child. We are grateful to her for taking time out from her busy schedule to be our web designer. Rachel is the oldest of Loren and Gloria Wissmann's 13 talented children. The Wissmanns have a traveling bluegrass/gospel band and have released 10 CDs since 2006. Be sure to check out their website. The banner goes in the order of the kids and not by who is married and who isn't. I think they're listed in birth order-- Alyssa's sixth in the line-up! Because the bates kids are organized by age :). 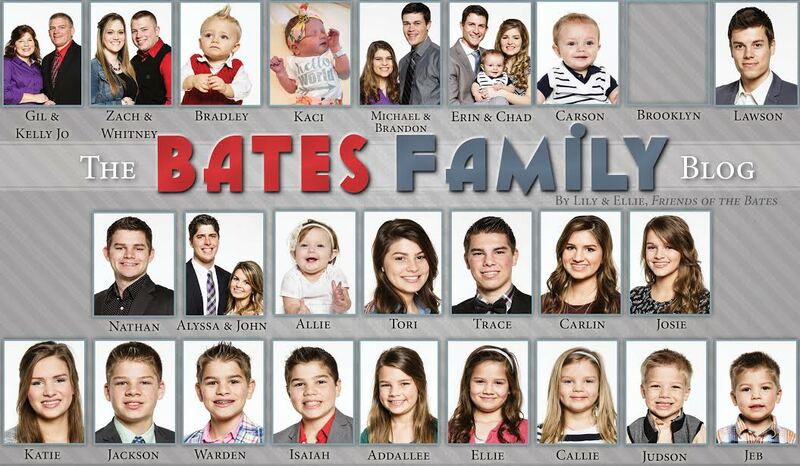 I believe the Bates children are still ranked by birth order. Great new photo!!! Love watching you! It looks good nice God Bless y'all !! katie is getting sooo pretty!! Why isn't Katie ever in the interviews? She seems to be the only one at home that's not on the show. I hope that's her choice. Personally, I liked the old color scheme better, but I like the new pictures!!! It looks nice! Good job! I never realized how much like Erin Katie looks! I hope you are able to keep up with pictures of the little ones as they grow fast. I always appreciate new Bates pictures. Will she be updating it again, when Brooklyn Alease is born? Everyone looks great, but I think little miss Allie Jane looks particularly adorable out of the bunch :) Also, Callie-Anna looks so old! When did that happen?! The new theme looks great as well, ladies! I agree Katie looks JUST like Erin! I like the new banner BUT why the dull color of gray? :( I think it should be a much more energetic happy color like yellow or any bright color! Much more pleasing to the eyes! I think they wanted to do a natural background to make the photos pop. also there wouldn't be a problem of clashing colors. Very nice job done, Katie is so adorable!!! I wish the show was an hour long.. Good people wholesome show. Please put some color behind these cute people......the white is very stark. I love the updated pics. Love the new header. The little ones have grown up fast. Katie looks so much like Tori and Carlin. It's pretty, it looks very professional and I like the color scheme. There's one thing I don't like though, if I can say so: why are the grandchildren in the middle of the children? I think it would be even better if you put all of the children first, and then all of the grandchildren after Jeb, in birth order (so Brad, Allie, Carson, Kaci...). That way they would all be in birth order and you would see the original Bates family in a clearer way. Because Bradley and Kaci are Zach kids, Carson is Erin kid and Allie is Alyssa they why their next to their parents. I know WHY they are where they are, I'm just suggesting another way to put them, so that you can see better the original Bates family and they're all in birth order! Love it!!! Hope you're going to do something similar for your Duggar blog. The Duggars blog has been already be done. And the Duggars don't have anymore grandbabies being born yet. Like the updated format very much, but I think Katie should have been up one row by Josie. . . .the two almost always seem to be together in the shows. All in all lovely pictures. It's a cute picture of Erin,Chad and Carson. Its beautiful Rachel! Anxious to see what Brooklyn looks like! I love it!!!!! Tell Rachel great job! Wow Katie looks a lot like Erin! I love reading this blog, but these colors and the white background in the pictures makes everything look washed out. I think the color scheme distracts from the pictures instead of enhancing them. You need to change the color from gray to something else. I dont mean to sound harsh but that is an awful picture of Bradley. You should really change it. I think the new header is nice However I'm a bit disapointed in the picture slected for Bradley. There are so many pictures of him flashing that big sweet grin and the picture selected almost looks like he's near tears. This has to be one of few because every picture I've seen he's has a huge grin. I don't understand Bradleys hair. Why not have small family photos instead? For example, A family photo of Zach and his family in one shot. Having couples then their kids seems so much. Like that you're asking for input and understand if you choose to not use it.